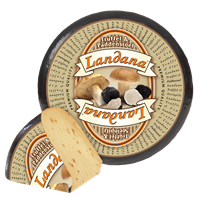 Landana TRUFFLE & CEP is the newest specialty cheese in the Landana assortment. This Dutch cheese has a delicious taste and impresses every cheese lover with fine ingredients like black truffle, cep and fenugreek. Landana TRUFFLE & CEP is perfect on a cheeseboard, on crackers or grated in pasta dishes. No colorings, preservatives or artificial flavoring. Lactose (<0,1g/100g) and gluten free. Contains vegetarian rennet.